O God, who have been pleased to increase your adopted children in all the world, and who made the blood of the Martyrs Saint Andrew Kim Tae-gon and his companions a most fruitful seed of Christians, grant that we may be defended by their help and profit always from their example. Through our Lord Jesus Christ, your Son, who lives and reigns with you in the unity of the Holy Spirit, one God, for ever and ever. During the 17th century the Christian faith was brought to Korea through the zeal of lay persons. From the very beginning these Christians suffered terrible persecutions and many suffered martyrdom during the 19th century. Today's feast honors a group of 103 martyrs. 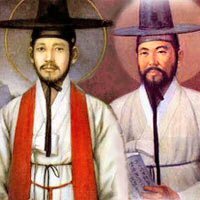 Notable of these were Andrew Kim Taegon, the first Korean priest, and the lay apostle, Paul Chong Hasang. Also among the Korean martyrs were three bishops and seven priests, but for the most part they were heroic laity, men and women, married and single of all ages. They were canonized by Pope John Paul II on May 6, 1984. Before the reform of the General Roman Calendar today was the feast of St. Eustace and His Companions. He was a martyr whose cult was introduced at Rome in the early Middle Ages. This first native Korean priest was the son of Korean converts. His father, Ignatius Kim, was martyred during the persecution of 1839 and was beatified in 1925. After baptism at the age of fifteen, Andrew traveled thirteen hundred miles to the seminary in Macao, China. After six years he managed to return to his country through Manchuria. That same year he crossed the Yellow Sea to Shanghai and was ordained a priest. Back home again, he was assigned to arrange for more missionaries to enter by a water route that would elude the border patrol. He was arrested, tortured and finally beheaded at the Han River near Seoul, the capital. Paul Chong Hasang was a lay apostle and a married man, aged forty-five. Christianity came to Korea during the Japanese invasion in 1592 when some Koreans were baptized, probably by Christian Japanese soldiers. Evangelization was difficult because Korea refused all contact with the outside world except for an annual journey to Beijing to pay taxes. On one of these occasions, around 1777, Christian literature obtained from Jesuits in China led educated Korean Christians to study. A home church began. When a Chinese priest managed to enter secretly a dozen years later, he found four thousand Catholics, none of whom had ever seen a priest. Seven years later there were ten thousand Catholics. Religious freedom came in 1883. When Pope John Paul II visited Korea in 1984, he canonized Andrew, Paul, ninety-eight Koreans and three French missionaries who had been martyred between 1839 and 1867. Among them were bishops and priests, but for the most part they were laypersons: forty-seven women, forty-five men. Among the martyrs in 1839 was Columba Kim, an unmarried woman of twenty-six. She was put in prison, pierced with hot awls and seared with burning coals. She and her sister Agnes were disrobed and kept for two days in a cell with condemned criminals, but were not molested. After Columba complained about the indignity, no more women were subjected to it. The two were beheaded. A boy of thirteen, Peter Ryou, had his flesh so badly torn that he could pull off pieces and throw them at the judges. He was killed by strangulation. Protase Chong, a forty-one-year-old noble, apostatized under torture and was freed. Later he came back, confessed his faith and was tortured to death. Today there are approximately four million Catholics in Korea. Excerpted from the Saint of the Day, Leonard Foley, O.F.M. Symbols: Palm frond (for martyrdom); martyr's crown. Study the emphasis of the role of the laity in the Church especially in this century, and decide on things you can do as a layperson to help your parish community. Read Pope John Paul II's homily at the canonization of the 103 Korean Martyrs, read about some of the other Korean martyrs. The charming legend of Saint Eustace tells how a Roman general named Placidus was once out hunting. He pursued a noble stag, which suddenly turned and approached him. Between the stag's antlers Placidus saw a crucifix. A voice was calling him by name. The hunter himself had been caught. The vision converted Placidus. He changed his name to Eustace, and gave away much of his money. The saint still felt able to serve the Roman emperor. Taking up his command again, he led the legions to great victories. By this time his family had become Christian too, and all four of them — Eustace, his wife Theopista, and his sons Agapetus and Theopestus — refused to make sacrifices to pagan gods in the celebrations following his own victories. All four were accordingly put to death in a bizarre fashion. They were taken to the colosseum in Rome, encased in a bronze bull, and roasted to death. Although these events are supposed to have taken place around the year 118, no account of Saint Eustace and his family has been found prior to the seventh century. Yet he became one of the most popular saints in the middle ages, celebrated in prose and poetry as well as in art and popular devotion. Eustace is one of the Fourteen Holy Helpers, and he is venerated as the patron of hunters. Patron: against fire; difficult situations; firefighters; hunters; Madrid; torture victims; family troubles. Symbols: crucifix; stag; oven; white stag on a rock, with a crucifix between antlers; boar spear; hunter's horn; lion; Roman armour; bear, wolf or dog; wicker basket; brazen bull with a fire under it.